Long ago in a time best left forgotten, you first jumped aboard the Essex County Express to Dunwich in search of the missing professors who had uncovered a terrible secret in the quiet New England village. You stared into the face of madness, defeated the atrocities, and came out the other side. But such horrors are hard to kill. Now you must abandon your fear and face the unholy abominations once again, now stronger than ever before. But you are far from defenseless. 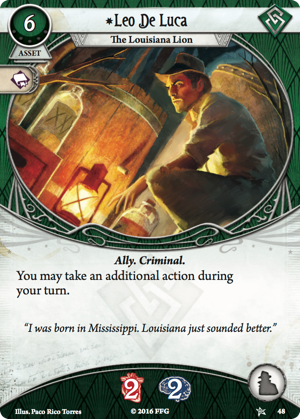 Today, we're pleased to offer you a closer look at the new customization opportunities for your investigator decks in the Return to the Dunwich Legacy upgrade expansion for Arkham Horror: The Card Game—now available for pre-order at your local retailer or online through our website! 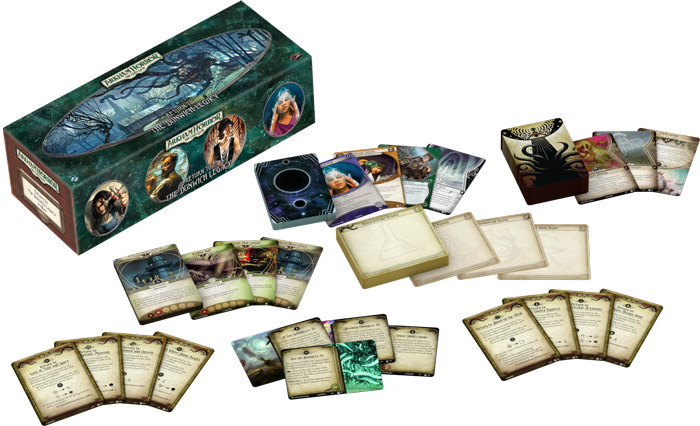 As your adventures progress, Arkham Horror: The Card Game continues to lift the veil between card and roleplaying game experiences as your investigators learn and grow, gaining experience that can be used to hone their skills and train them in the use of new assets. Return to the Dunwich Legacy provides you with 23 new player cards to integrate into any deck, allowing you to pursue new deckbuilding opportunities and opening a new world of madness, whether you return to The Dunwich Legacy or enter a different campaign. Among these, you will find many upgraded versions of cards that appeared not only in The Dunwich Legacy deluxe expansion, but across the entire The Dunwich Legacy cycle. 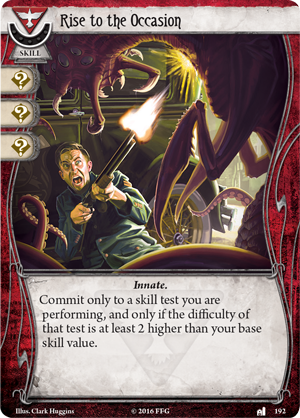 Some of these cards, like Preposterous Sketches (Return to the Dunwich Legacy, 3) offer you the same abilities at lower costs, while others have increased strength or effectiveness, and still others have new abilities altogether. For example, the Bandolier (The Essex County Express, 147) you first found aboard the train to Dunwich gave you the ability to hold an additional Weapon, and now its upgraded version (Return to the Dunwich Legacy, 1) doubles that ability, and features an entirely new effect. 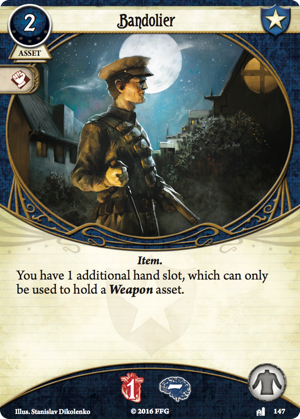 If you are well armed when you confront the powers of the Mythos, the card also grants you added willpower as you feel more secure in the knowledge that whatever comes, you can face it with stoic resolve and an ample supply of ammunition. Beyond classic weapons of the Guardians, Survivors also gain access to versatile skills, like the upgraded Rise to the Occasion (Return to the Dunwich Legacy, 10). 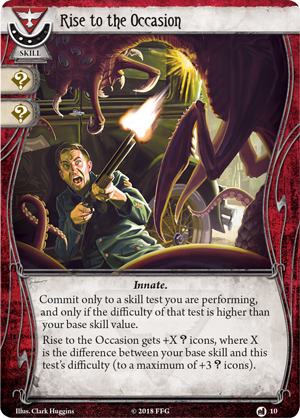 At first glance, the card’s three experience cost and loss of an icon from its original version (Blood on the Altar, 192) may give an investigator pause before adding it to their deck. But, much like the Survivor class itself, this card is far more than it seems. 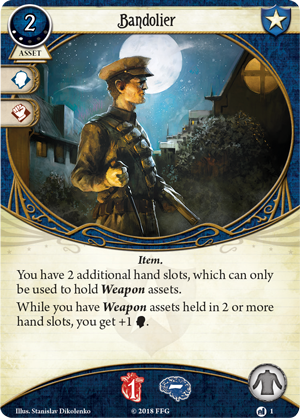 In addition to the two wild icons on the card, this skill also gains up to three wild icons; one for each point between your investigator’s base skill and the test’s difficulty. 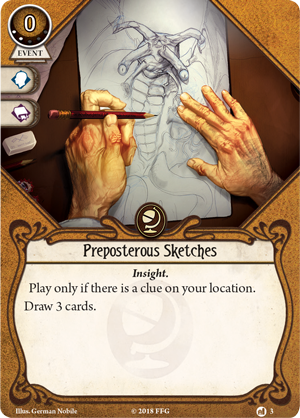 While this card is powerful in any investigator’s hands, there is one you've met along the way who can bring out its full potential. After the case in Dunwich first closed, you had the chance embark on a scientific expedition in The Forgotten Age, where you met Calvin Wright (The Forgotten Age, 5), who has a zero for all of his base skills. 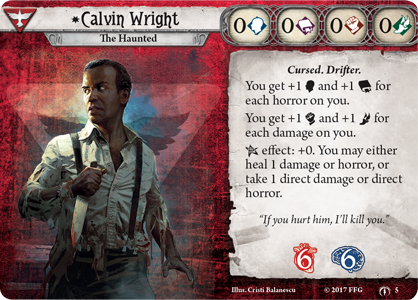 Combined with his ability to better his skills for each horror and damage he suffers, Rise to the Occasion gives Calvin the chance to gain an amazing five wild icons for a skill test, even if his damage and horror are raising the actual value of his skills! After all you have seen in your investigations into the occult, you may think that nothing can rattle you, but you will need all the help these new implements can offer if you dare to return to the terrorized town tucked in the New England countryside. 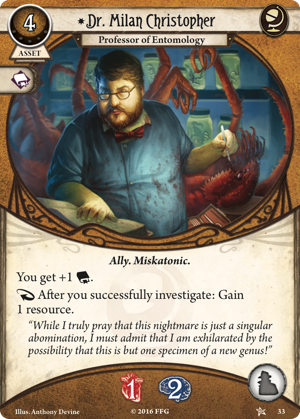 In addition to the new weapons and tools with which you can customize your investigators’ decks, Return to the Dunwich Legacy also challenges you with a new basic weakness. When you journey Through the Gates (Return to the Dunwich Legacy, 11), you must draw the first card in your deck, and if it is not a weakness, remove it from the game. As if that were not punishment enough, this dark Pact forces you to search for any other copies of the discarded card and remove them as well. This means that even if you think you are prepared for the trials ahead, nothing can save you from the hand of fate. Rogues may find their turns cut short without the help of Leo de Luca (Core Set, 54), while Seekers struggle for resources when Dr. Milan Christopher (Core Set, 33) is taken beyond the void. Should this weakness make its way into your deck, you may wish to diversify your collection and perhaps even attempt one of the Ultimatums included in this expansion. For example, the Ultimatum of Chaos states that the thirty chosen cards of your investigator’s starting deck must be selected at random from among all eligible options, while the Ultimatum of the Highlander demands that your investigator’s deck only include a single copy of each card. With these increased challenges, you may risk not having the cards you need at a moment’s notice, but in Arkham, nothing is safe. And if you are going to meet your end in Dunwich, you may as well go out in a blaze of glory. Now that the call to arms has been issued once more, you cannot turn away from those who have placed their faith in you, no matter how much you may wish to turn and run. 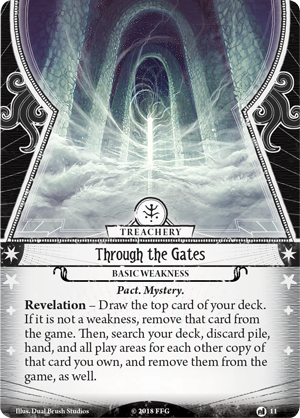 There is no telling what awaits you beyond the veil, but by learning from your past experiences and using every tool in your arsenal, you can face whatever dangers the Mythos has in store! 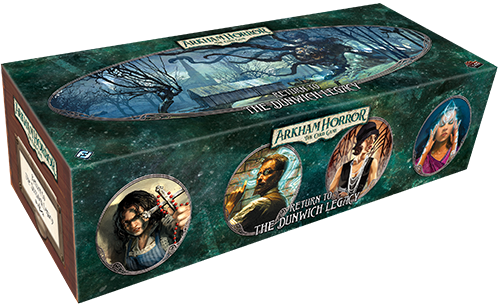 Pre-order your copy of Return to the Dunwich Legacy (AHC28) at your local retailer today or online through the Fantasy Flight Games website here!